Bedrock Automation has introduced a lower-cost and high-performance controller that combines PLC, RTU and edge control; intrinsic cyber security; and universal I/O into a compact standalone module that is ideal for remote monitoring and control applications. The Bedrock OSA® Remote is configured with the standard Bedrock IEC 61131-3 engineering tools, and features a wide operating temperature range, a hardened metal enclosure, and pricing below conventional mini PLCs or RTUs. Universal I/O. Each OSA Remote channel can be programmed for analog, discrete and digital connectivity supporting pulse, AI/AO, DI/DO, HART 7, BSAP, RS-232/485/422, Ethernet IP, ModBus TCP, 61850, DNP3, PROFINET, DeviceNet, CAN Bus and BACnet. Such a broad array of options dramatically reduces engineering time, maintenance and spares management. Other vendors have some programmable I/O in their premium DCSs, but no one delivers as much flexibility to the edge as Bedrock Automation. Open Connectivity. Much of the benefit of the IIoT and Industry 4.0 innovation depends on open connectivity, but that comes with risk. Bedrock OSA Remote provides a secure SCADA uplink for OPC UA, and will also support MQTT and DDS later this year. This gives end users more flexibility in deploying the applications that are best for their business. OSA Remote takes up minimal cabinet real estate, which is important in remote areas where space is at a premium. Free engineering software. Where most other companies charge thousands of dollars in license fees for their engineering software, Bedrock Automation provides IEC 61131-3 standard software that is free for an unlimited number of users. Broad temperature range. 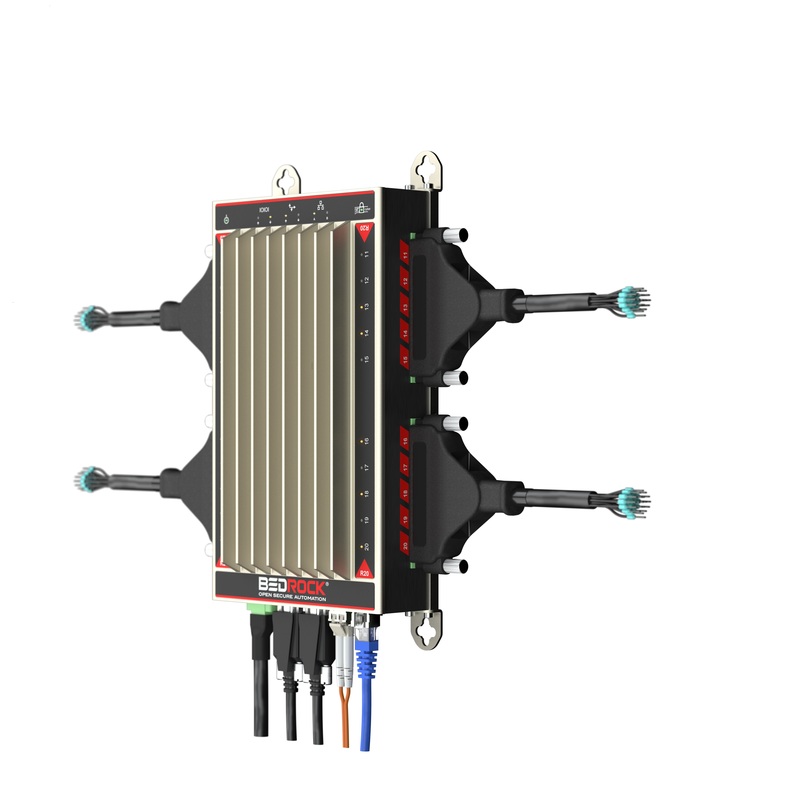 All Bedrock OSA Remote controllers operate at temperature ranges between -40° C and +80° C without fans or forced draft, providing lower cost and higher reliability. Computing power. With an array of cyber secure and multi-core ARM processors, 512Mb RAM, 8Gb or 32Gb Flash, MRAM for retained variables and a supercapacitor to retain firmware for years without power, OSA Remote has the computational power and communication bandwidth needed to run the advanced edge control and analytics expected in a modern deployment of automation. Intrinsic cyber security. In addition to preventing costly and potentially dangerous cyber intrusion, Bedrock intrinsic cyber security reduces the need for external firewalls, intrusion detection and other devices. This intrinsic security can even extend protection to other legacy systems, functioning as a secure proxy.